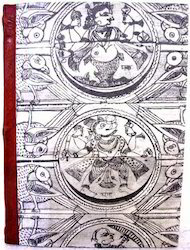 We are also manufacturing notebooks with indian print themes. We manufacture a large range of handmade paper notebooks. Our notebooks are available in a large variety of sizes. We are also manufacturing notebooks with embroidered covers. Our animal theme notebooks with animal design print are quite popular. Our company is the supplier of Handmade Paper Notebook made using fine quality papers. We offer a notebooks made from handmade paper with pretty designs. These notebooks are ideal for scribbling and jotting down thoughts or doodles. Finished with a matching ribbon page marker. Notebook contains 160 sheets (320 pages) of ruled white paper. Measures (approx) 127x170x22mm. Available in different sizes, color and patterns. Leveraging on our skilled and qualified professionals, we are actively involved in offering a trendy range of Handmade Printed Cover Notebook to our valuable customers at pocket-friendly prices. These notebooks/journals are crafted from handmade paper and are perfectly binded to ensure strength and durability. 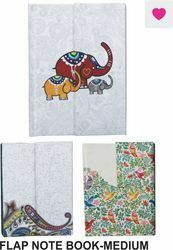 These handmade notebooks come along with a Neem Pencil and bear a very trendy design. Perfect to write your daily experiences and much more.